We are gradually making improvements to the whole of this website to implement "mobile first" design principles. The aim is to make the whole of the website mobile-friendly. This is a work in progress. We also maintain our mobile website and this will continue to be provided until all modernisation work on the main site is completed. 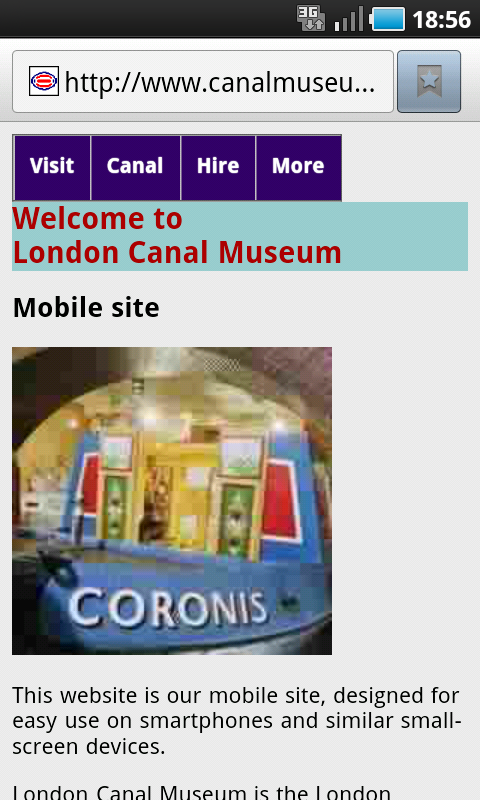 After that the mobile site canalmuseum.mobi may continue to be used for outdoor activities such as guided walks. Our mobile website is designed to be smartphone-friendly. It is a smaller version of the main site with all the essentials about the main services that we offer in pages formulated to be conveniently read on a smartphone. The site includes the Webwalk, a guided canal walk from Camden Town to the museum, guided by your mobile phone. Gradually work is taking place to make the whole website mobile-friendly. The following sections of the main website are now designed to be used on mobile phones, tablets, or desktop computers. Other sections have yet to be converted to mobile-friendly design and work is ongoing.